To stay fit, adult dogs of all breeds need a diet rich in high-quality proteins combined with sufficient levels of essential fatty acids. 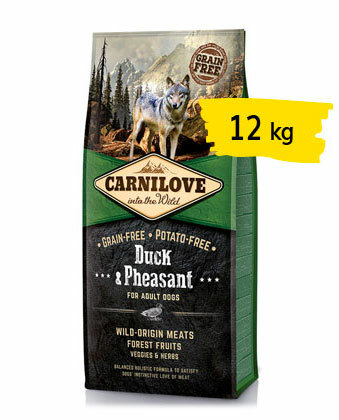 The Carnilove range for adult dogs has been formulated to closely resemble the original natural food of dogs and their genetic ancestor, the wolf, whose diet primarily comprises muscle, off al, and bone obtained from prey balanced with the correct proportion of wild berries, vegetables, and herbs. 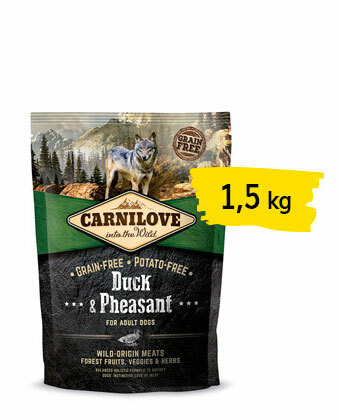 Meat and fat from wild fowl and fish deliver all the vital nutrients adult dogs require to maintain optimal physical condition and a healthy immune system. Duck is an ideal source of proteins and is rich in polyunsaturated fatty acids (PUFA), which reduce blood cholesterol levels. It’s a fantastic source of niacin (vitamin B3), which plays an important role in metabolic processes within the body and also helps to lower blood cholesterol levels. Duck contains vitamins A and C as well as important minerals such as iron, calcium, and selenium, while pheasant is an excellent source of vitamin B12, phosphor, and selenium. The combination of duck and pheasant creates a dietetically balanced and nutritious food containing all the essential amino acids.